While many children work hard to master basic skills such as counting to 10 and not soiling themselves, others possess preternatural abilities that basically make the rest of their age group look like underachieving chumps. 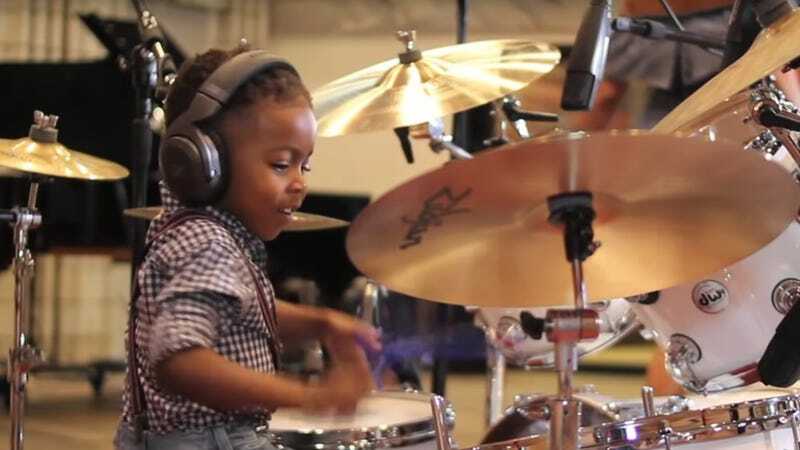 One such kid is “Babyboydrummer,” a 4 year-old who beats the skins with the kind of single-minded determination more often found in his peer-group smashing Cheerios in their high chairs. Stubby limbs flying out in all directions, BabyBoyDrummer (real name Justin “LJ” Wilson II) is a goddamned prodigy. The above clip is only a hint of the BabyBoyDrummer empire, which extends to YouTube, Instagram, and an official website detailing his development from a 4 month-old who “his parents discovered ... could match pitch” to a 15 month-old child who “was able to identify and mimic unique syncopations and tinker on the piano in the correct key as a song was played.” Now, years of experience under his miniature belt, BabyBoyDrummer puts out kids music and, more compellingly, videos of him playing by himself or with his musician dad, the likes of which date back to him at 2, rocking out in a onesie. They’ve rolled on to our modern day, in which a mature, dignified toddler shows off the sort of sophisticated musicianship that can only be achieved once one has freshly graduated from diapers. He’s also managed to connect with a 6 year-old bassist, forming the most adorable rhythm section since Paul and Ringo got matching haircuts. It’s entertaining as hell to watch the little dude playing his heart out, smiling and waving his head around in sheer musical delight, but the videos are also a good reminder that literally every other child you know is underperforming, no matter how proud their small, meaningless accomplishments make their parents. Thanks for that, BabyBoyDrummer.